The most important phase of writing your book has nothing to do with the actual act of writing. It is in finding the right people who will promote the book to the world and turn potential readers into your buyers. These influencers are the people that have the right kinds of followers in their networks. And they can become very powerful allies in your book marketing plan, and the cost to use them is pretty much just your time, and tenacity. So how do you find these folks? The first thing is looking at your own social media networks, and making a list of the people that would be relevant to the topic of your book. What, you don’t have many friends on your networks? Now is the time to get busy friending people, and seeking out folks that could become pathways to promotion. You don’t need thousands of names, but you do need to approach this task on a regular basis, and friend new people every day. For those of us who are introverts, this can be painful, and can run counter to our instincts to hide behind our computer screens. Try to fight this, and reach out to people across your neighbors, your work colleagues, your church or other social organizations, and so forth. One thing you don’t want to do is to buy lists of names. While this is certainly possible, you don’t know the quality of the names you are getting, and chances are many of these names aren’t going to be helpful to your book promotion anyway. Save your money. Next, figure out the keywords that describe your audience, topic, focus, and what they are interested in and why they would buy your book. This means using these keywords to do many Google searches. Many means hundreds. Sometimes, you want to combine two or three keywords to be more effective. Next, pick your social media network where your audience will hang out. If your book has a visual component, then stick with Pinterest or Instagram. If you have news-related content, Twitter. If it is general interest fiction, Facebook. Business-related topics, LinkedIn. These aren’t hard and fast choices, and feel free to experiment with more than one social network if you have the time. This doesn’t mean you need to craft a separate collection of Tweets, Pinterest Pins, etc. In fact, you can share announcements across multiple social networks. 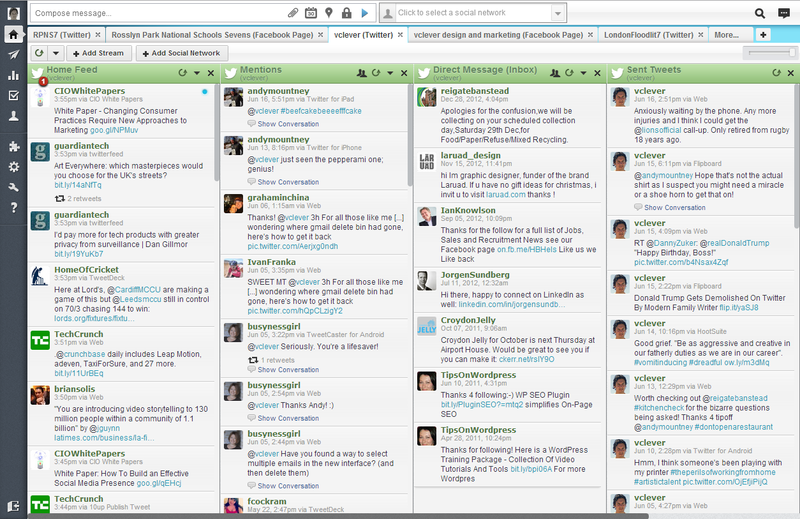 A good tool to do this is Hootsuite (shown here). While you are doing all of this, you should settle on your book title and domain name for your book’s website. Yes, you need a website. Part of that website should be an email newsletter, where you tell your potential readers what is going on with your book, so they can get involved in its writing and production. You should commit to writing one post every week in the months leading up to your book launch on your website. After all, you are a writer! Next, start collecting email addresses from your social media connections and use them to populate an email list. There are plenty of low-cost web hosting providers out there, and plenty of choices with email server companies such as MailChimp, ConstantContact, SendGrid, and others. Many of these services have free plans if your list is small, so take advantage of them. You can send out a new email with a copy of each blog post to save time if you wish. Finally, start thinking about collecting reviewers. There is an entire universe of Amazon influencers, but I won’t get into that here.Look at NetGalley, especially if you want to join the IBPA. This is a website that is used to promote new books to a list of active readers and reviewers. Good luck with your marketing!